From Op Art to Pop Art The NANORESTART team takes on Lichtenstein’s Whaam! Whilst colleagues in the Sculpture Conservation Department continue to explore ways of locating their missing artist Michael Dillon, the Tate NANORESTART science team and painting conservator Rachel Barker have turned their attention to Whaam! 1963 by Roy Lichtenstein, a painting that has been in Tate’s collection since 1966. A myriad of different gallery labels on the reverse of the painting’s protective backboard suggest that in the past 50 years it has been enjoyed by audiences far and wide, the fanfare contributing to its well-deserved iconic status. However, this jet-set life style has also resulted in the current slightly soiled appearance of the artwork. The white highlights are looking grey and there are greasy finger marks around the edges of the paintings, a vestige from the decades past, deposited before we realised that gloves must be worn when handling art works. Thanks to Tate conservation scientists past and present, we already have a pretty good idea of the types of paint Lichtenstein used to make this work. Whaam! is comprised of three different paint types – the priming is white oil-modified alkyd paint, oil paint was used to create the passages of blue and blue – red dots, and Magna acrylic solution paint was used for the red, yellow, some white and black compositional elements. On the finished surface of Whaam! the three different paint types look almost identical. On closer inspection, they can be discretely distinguished by their different levels of gloss. Having three different types of paint on the same artwork makes cleaning particularly challenging. Each paint type varies in its response to the kind of cleaning options we have, so whilst mineral spirits may be appropriate for the oil paint, this solvent can easily damage the Magna paint. This is a challenge which we hope can be alleviated by the novel cleaning strategies introduced through the NANORESTART project. Of course we cannot use Lichtenstein’s painting to test new cleaning materials and refine treatment options so the team have been making test paintings (or mock-ups) to be used for this purpose. To create a test painting that would respond in a similar manner to Whaam! they have attempted to recreate the layering process used by Lichtenstein with the same types of paints. First, they stretched a medium weight artist’s cotton canvas onto four stretchers and primed each with a layer of white oil-modified alkyd paint. The priming layer seals the cotton canvas and prevents subsequent films from bleeding through to the back. 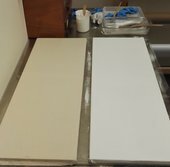 Two stretched cotton canvases – one unprimed (left) and the other primed with white alkyd paint (right) – being used as mock-ups for cleaning tests. Next, a layer of dots, mimicking the Ben-Day dots used by Lichtenstein, were applied. Ben-Day dots are characteristic of a printing process named after printer Benjamin Day. Their specific juxta-positioning creates an optical effect similar to the Pointillism technique used by artists like Seurat at the end of the nineteenth century. Depending on the effect desired, small dots of a carefully selected colour can be closely, widely spaced, or overlapped. In Whaam! these blue and red-blue dots evoke the appearance of commercially printed images but also the optical effect created suggests movement and consequently a dynamism to the composition, were we to momentarily disengage with the painting’s title. By the time Whaam! was painted in 1963, Lichtenstein was employing a studio assistant to do the Ben-Day dot stencilling,4 as if to further remove evidence of his own hand at work on the surface. 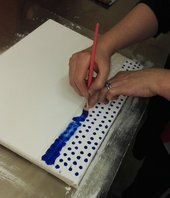 Rachel and Lora hole-punched strips of thick plastic film to create a Ben-Day dot stencil which was used to paint blue oil paint dots on one of the canvases. Magna paint was not added on top of this dotted canvas as there are large parts of Whaam! which only have oil-painted Ben-Day dots and a layer of soiling – the mock-up would represent these parts of the artwork during the cleaning tests. The finished mock-up panels. The rectangular canvases have a layer of alkyd priming and Magna-like acrylic solution paint in similar justapositions of colour as those on Whaam! ; the smaller canvas has the same alkyd priming with oil painted ‘Ben-Day’ dots. The other three primed canvases were painted with Magna-like acrylic paint (Golden MSA paints, which were kindly donated to the project by Golden Artist Colors). On Whaam!, the black paint borders all of the other coloured areas – so the mock-ups were created in stripes of black with red, black with yellow, or black with white. This strategy was used to create the same juxtaposition of colours as those used on the artwork, which should help in the cleaning tests. After three days of air-drying, the mock-ups were moved to the artificial ageing chamber so that the paints can undergo, at least partially, some of the types of natural ageing processes that the original painting has endured. Mid-way through the artificial ageing, artificial finger grease and indoor soil will be applied to their surfaces as a final step before the cleaning tests begin. 1. Smithsonian Archive of American Artists, Leonard Bocour interviewed by Paul Cummings, New York, 8 June 1978, transcript pp.18–20. 2. Jo Crook and Tom Learner, The Impact of Modern Paints, London, 2000, p.117. 4. James Rondeau and Sheena Wagstaff, Roy Lichtenstein, A Retrospective, London and Chicago, 2012, p.31.